Politician. Republican. Born: March 23, 1842, Springfield, Vermont. Died: December 16, 1883, Washington D.C. Served in U.S. House of Representatives, 2nd District: March 4, 1877, to December 16, 1883. Moving to Lawrence, Kansas Territory, from North Brookfield, Massachusetts, with his parents at age thirteen, Dudley Haskell, who had been born in Springfield, Windsor County, Vermont, on March 23, 1842, returned to Springfield to attend school in 1857 and 1858. Haskell then engaged in the shoe business and followed the gold rush in 1859 to Pikes Peak, Colorado, where he resided until 1861. Haskell served as assistant to the quartermaster of the Union Army in Missouri, Arkansas, Kansas, and the Indian Territory in 1861 and 1862 but left the service to attend Williston's Seminary, Easthampton, Massachusetts in 1863. He graduated from Yale College in 1865 and returned to Lawrence where he once again entered the shoe business. 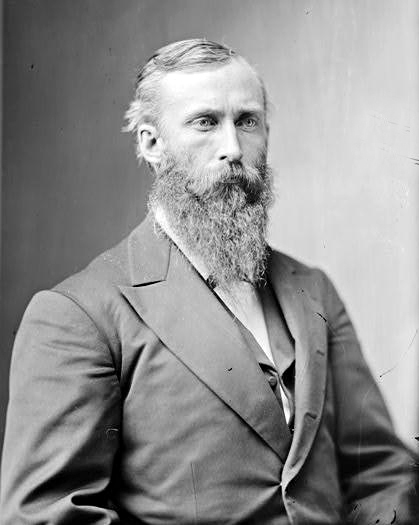 Haskell served in the state house of representatives in 1872, 1875, and 1876 and was first elected to the U.S. Congress in 1876 for the term beginning March 4, 1877. He was thrice reelected, and served as chairman of the Committee on Indian Affairs, but died in Washington, D.C., on December 16, 1883, before the end of his fourth term. He was buried in Lawrence's Oak Hill Cemetery.